Radio Free Asia (RFA) announces the release RFA May 2017 QSL, the fourth QSL card in the series highlighting the International Broadcasting Bureau (IBB) transmitter sites used for RFA programming. RFA programs also broadcasts from these IBB sites: Biblis, Lampertheim, Saipan and Tinian. 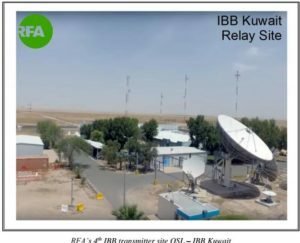 IBB Kuwait is one of the most cost-effective transmitter site’s in IBB’s inventory. It is also an integral part of IBB’s global satellite interconnect system (SIS) carrying RFA programming where needed. This is RFA’s 64 th QSL overall and will be used to confirm all valid RFA reception reports from May 1 – August 31, 2017. RFA encourages listeners to submit reception reports. Reception reports are valuable to RFA as they help us evaluate the signal strength and quality of our transmissions. RFA confirms all accurate reception reports by mailing a QSL card to the listener. RFA welcomes all reception report submissions at http://techweb.rfa.org (follow the QSL REPORTS link) not only from DX’ers, but also from its general listening audience. If you have a smart phone, feel free to use the QR code below to access our main website for the latest news and information from Radio Free Asia.